How do I set a colored pattern for a segment, area, or bubble? 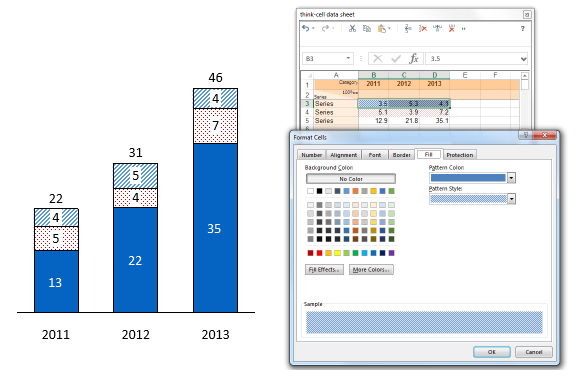 Left-click on the chart and check Use Excel Fill on Top in the color scheme control. Set the desired combination of fill color and pattern in the dialog → OK. In area charts, the fill color and pattern of the cell containing the series name determines the style for the whole series, across all categories. The fill color and pattern of individual data points' cells has no effect. In bubble charts, the fill color and pattern can be applied to any cell that belongs to the respective data point. You have the option of customizing think-cell's menus on a per-file or per-template basis with think-cell style files as described in our user manual at Appendix C: Customizing think-cell. The pattern fill option is explained in Appendix D: Style file format.